Recently I've received so many questions about how to join our Nath Sampradaya, how to enter to Natha's Community etc. Generally it is a good, important question and I'm going to consider it. The state of non-manifestation is perceived as having the nature of Guru, it is timeless, it destroys time, gives the greatest happiness, eliminates confusion. Dwells in the body, totally radiant, bestowing the perfection of Will (ajna), it's the pure essence of the doctrine of perfect. Siddha-siddhanta Paddhati also explains (VI part) that any practice, any sadhana will be wasted without true Guru. So Guru is the first you should begin to join the Nath Sampradaya. The relation between Guru and shishya (disciple) is very sacred, very spiritual, very important, it's beyond the time because Guru leads to Moksha and Mukti. That's why, if sadhaka really goes to Moksha, if he really wants to grow in spirit, that Guru is the most important for him than anything else. For this reason a sadhak should look for a Guru who is close to his heart. Guru will give ashirvaad (blessing) to all disciple's activity, to all sadhanas. Today you can find all techniques and methods in books, in specialized movies, in internet… But only Guru can give the power to your practice, Shakti, and the right yogic result. Only Guru can recommend some effective methods for you because he knows your nature, he sees your Atma. If sadhaka finds a good Guru and Guru also agrees about that shishya, then Guru gives the mantra-diksha, the initiation into the great Goraksha-mantra. And from this moment a wonderful journey to the Nath Tradition starts . Gradually, Guru acquaints a student with the rules and etiquette in sampradaya, with yogic views on practice, life, people, etc., explains how to live in society for the good results in sadhana. Guru looks on shishya - on his activities, on his condition, on his bhakti (devotion). After some time, if sadhaka showes himself as faithful and capable disciple, Guru can give him a choti-diksha (aughar diksha) that means sadhaka becomes a yogi of the Nath sampradaya. He receives nadi-janeu from his Guru. Nadi-janeu is woolen thread with whistle and some items like sphatik (rhinestone, crystal), mung (coral), rudraksha, pavitra (ring). It symbolizes the new energy structure of a human being, also whistle (nadi or naad) is related to nadanusandhana - one of the most effective practices leading to the comprehension of Atma. Aughar can live as grihastha (householder) or as sannyasi (monk) according to his understanding and world view. 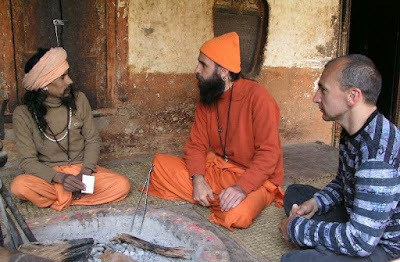 In India most of all aughars are sannyasi and live in ashrams or mandirs (temples). They wear a bhagava (special monk's cloth), observe celibate and do their sadhana and guru-seva. Aughar-grihastha also has a good chance to grow up in spirit, he just should harmonize his family life, his sadhana and seva. When aughar comes to understanding that his path is inseparably connected with the Nath tradition, he can decide to become a darshani, a completed Nath. Darshani is a yogi who wears the kundalas (rings) in the center of his ears that connected with control of ida (moon) and pingala (sun) energy. It helps him manage the sexual energy, transform it and move it up. During the chira-diksha Guru slots the ears of shishya and puts the kundalas in it, this way an aughar becomes a darshani. This process takes about 40 days, the days of tapasya which can give the some spiritual experience and the darshan of Gorakshanath. After that final diksha the development continues further because darshani usually dedicates every minute of his life to sadhana and perception of Atma. The Nath path is not easy but it is the way of your soul..so if you feel inside some aspiration to follow it...please, start! Contact number is = 09781666046. Aadesh, I am kiran suresh Kolate from pune. Daily I am reading navnath bhaktisar 40 aadhya and complete bhaktisar 1/2 times in year. I am in search of guru but I am not getting my way please guide me.